Location: Iverson St., Chatsworth. Parking is available at the side of the road outside the entrance to the Indian Springs community, usually under the 118 Freeway overpass. From Simi Valley, take the 118 Freeway to Rocky Peak Rd. Turn right and make an immediate left onto Santa Susana Pass Rd. Go 1.3 miles to Iverson Rd. Turn left and follow Iverson 0.3 mile to the 118 Freeway overpass and park where available. From the east, take the 118 Freeway to Topanga Canyon Blvd/CA 27. 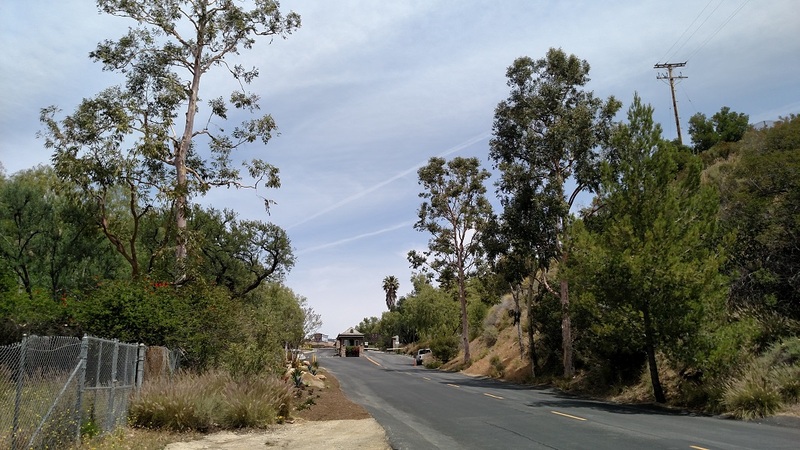 Head south on Topanga Canyon for 0.4 mile to Santa Susana Pass Rd. Turn right and go 0.9 mile to Iverson. Turn right and go 0.3 mile to overpass and park where available. On Google Maps, use the address 11390 Iverson Rd., Chatsworth, CA. This hike explores the rugged terrain of Rocky Peak’s back side. 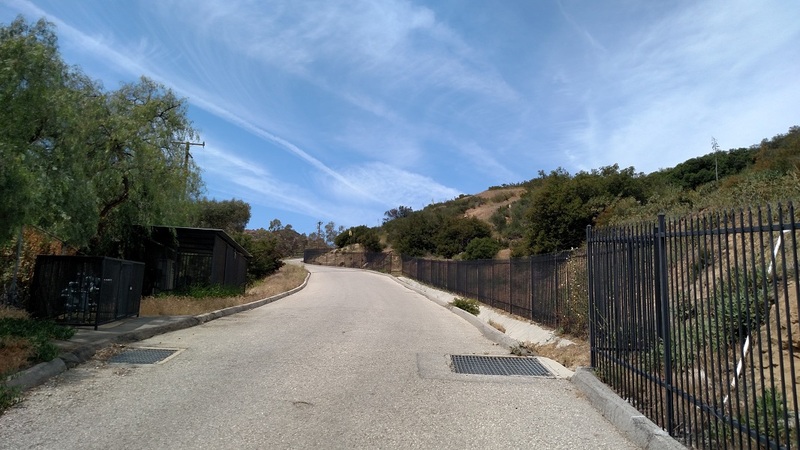 It starts in a gated community and climbs to the Rocky Peak Fire Road, about a mile north of the summit. Unless you have access to the Indian Springs or Fern Ann Falls communities, your hike will begin outside the guard house on Iverson Rd. Head north from under the freeway to the pedestrian gate, where you can ring a buzzer on the side for access. Inside, pick up the Santa Susana Pass Trail as it heads north along Iverson. At 0.3 mile, it leaves the road and threads its way between houses, crossing Fern Ann Falls Rd. at 0.6 mile. 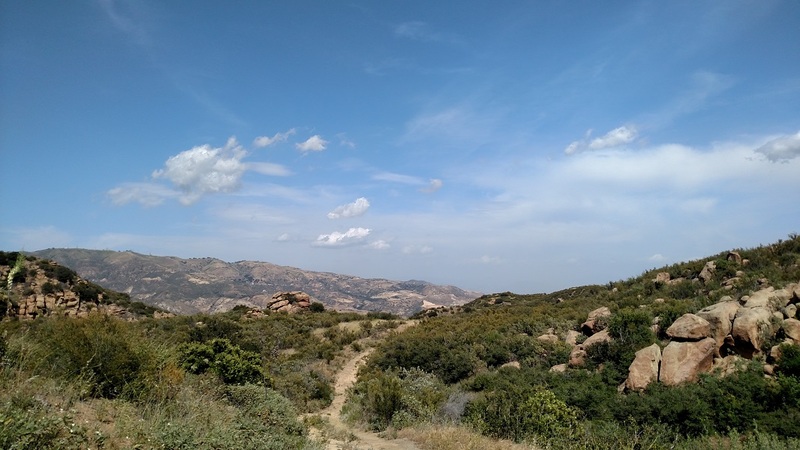 At 0.7 mile, leave the Santa Susana Trail and head northwest on Indian Hills Road. It climbs steeply uphill for 0.2 mile to an unsigned junction; this is the start of the Johnson Mountain Way. Bear left and follow a Johnson Mountain Way which starts as gravel and soon becomes a rocky fire road. The steady uphill climb continues before leveling out at a ridge line, with Rocky Peak dominating the western landscape and Oat Mountain to the east. 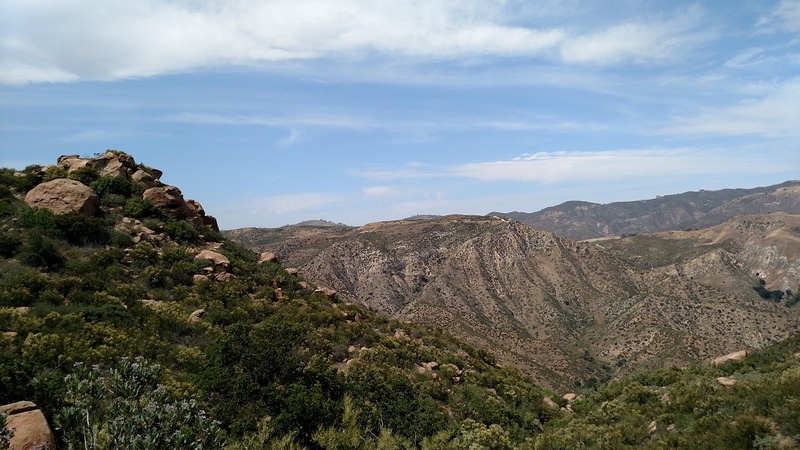 You pass by two spurs on the right leading to an antenna facility and the trail enters an interesting jumble of sandstone and granite boulders. Though still nominally a fire road, Johnson is basically a single-track by this point. Despite being only a few miles from civilization, this part of the trail feels pleasantly remote. 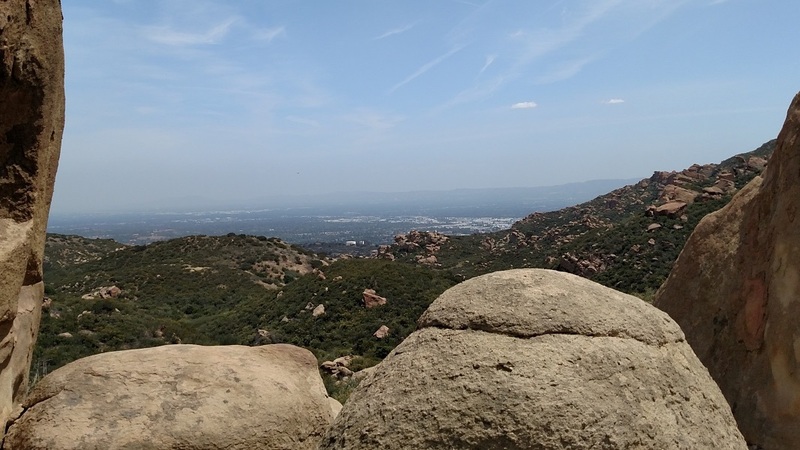 At 2.4 miles, a saddle-shaped rock on the left side of the trail provides a nice place to rest and enjoy a view of Chatsworth. 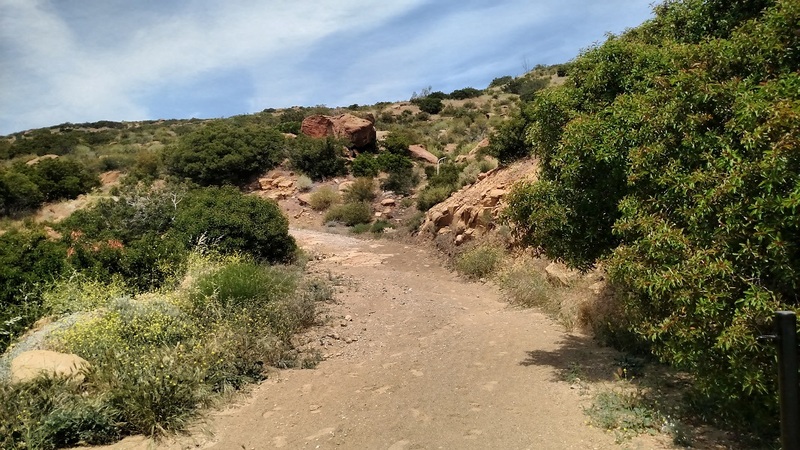 The trail follows the stream bed of Falls Creek, a tributary of Devil Canyon and makes one last climb before leveling out and meeting the Rocky Peak Fire Road, 3.3 miles from the start. Here, you can take in a panorama of Simi Valley to the west. This makes a good turnaround point for a day hike, although if you have time and energy you can head left (south) and continue to Rocky Peak. If you’ve set up a car shuttle at the Rocky Peak trailhead, you can descend via the fire road. This looks like a good one for a cool day when we are feeling vigorous! Yes…if you can get out there during May Gray/June Gloom season, you’ll probably be fine, otherwise enjoy it during the fall. Hi David – We tried this today, even though we are not fans of any kind of roads, fire or otherwise, nor particularly of this dry, rocky landscape. But, we had a date in Chatsworth later in the afternoon – so this seemed the best bet. We found it fascinating – for what it is. We took a wrong turn when the trail ‘left the road’ in the subdivision and went left, as a security detail advised us, through another gate. The mansions there were truly over the top – so we were glad we took the detour. We realized when we went back why we had missed the trail – the trail sign was covered by bushes from our perspective and the NO NO No (hikers, bikers, horses, etc.) sign kept us from going ahead. But, we got back on the trail. Then, we saw more of these NO NO NO signs and one right where the Johnson Mountain Way heads off. Curiously, also parked there was a (former) Crown Victoria police car, complete with police car lights, etc., but curiously an out of date license plate – it looked like it had been there a while – and a hikers sticker on it! So what’s the deal? Is it legit to hike up Johnson Mountain Way or not? Because of our schedule, we did not take on Rocky Peak (we had been there from the Rocky Peak Fire Road several years ago). The landscape here, with green abounding, is lovely and the views are wonderful. I did rate it “only” a 3 – more because it’s not the mountain wilderness and a one-track trail that appeal to us. But we were very glad to find this route on your site and appreciate your leading us to it. Don’t know how to leave pix here of the NO NO NO signs, but will leave them on your Facebook site. Hi Dianne, thanks for the update. I do not remember seeing any police cars or “no trespassing” signs when I was there but maybe they’ve been put up since (it was almost a year ago). 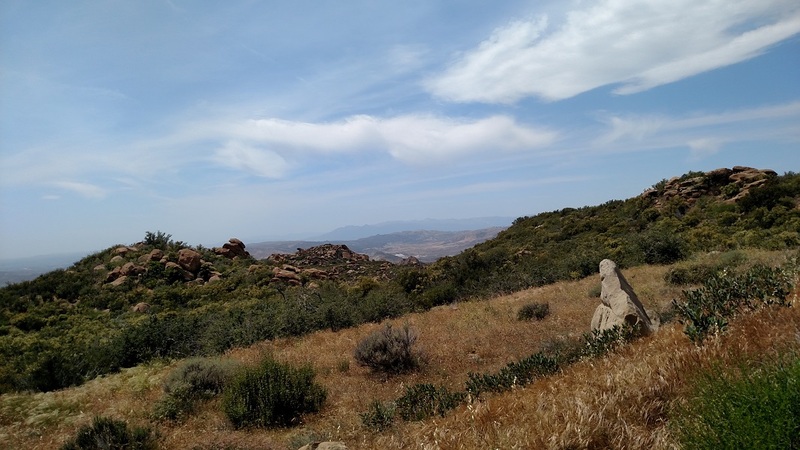 I checked back with the Ventura County Trails page (one of the links I included in my original write up) which is a good resource but there didn’t seem to be any updates there either. Next time I’m in the area I’ll try to check it out further and update this post. By the way I never knew that you were “Zelda Melda” on Facebook – you learn something new every day! As always thanks for reading and I’m glad you enjoyed the hike, no trespassing signs and all.